After gaining passenger loyalty in the US with its goal of “bringing humanity back to air travel,” JetBlue went international this year, adding flights to two Caribbean destinations. The airline that brought leather seats and free Live TV to the “no-frills”market also became the first US carrier to install bullet-proof cockpit doors throughout its fleet and security cameras in its passenger cabins. Passenger loads remain high, allowing it—the only US start-up to launch with more than $100 million in funding—to maintain its fleet expansion plan. Chairman and CEO: G. Richard Wagoner Jr. The world’s largest vehicle manufacturer, with a 15% global market share for cars and trucks last year, GM hit an industry sales record in the US when it became the first automaker to sell more than 2.8 million trucks in a calendar year and the first ever to sell over 1.3 million SUVs. Overall, GM brands scored a 10% improvement in the 2004 J.D. Power Initial Quality Ratings, while the company achieved a perfect-10 score in Governance Metric International’s global corporate governance ratings. Consumers spend some $33 billion a year on Pepsi-Cola beverages, including Pepsi, Diet Pepsi, Pepsi-One, Mountain Dew, Sierra Mist, Slice and Mug brands. Its non-carbonated beverages include Aquafina bottled water, Fruitworks and Tropicana fruit juices, and All Sport and Gatorade sports drinks. Pepsi brands have been sold internationally since 1934 and are available in nearly 200 countries and territories. This year, it re-launched production in Iraq.The company’s $1 billion sweepstakes, initiated in 2003 and repeated this year, is the largest in television history. Pepsi is an active sponsor of efforts to combat HIV/AIDS in Africa. While not generally a household name beyond its Morton and Windsor table salt brands, Rohm & Haas’s innovations offer household and corporate solutions that range from ways to extend produce freshness and purify antibiotics to developing more effective industrial adhesives. The specialty chemicals firm manufactures products for the personal care, grocery, home and construction, and electronics industries. The world’s largest supplier of monomers and a global leader in the sodium borohydride market, it operates in more than 27 countries and markets its products in more than 100, producing annual sales revenue of $6.4 billion. Dell’s strategy of selling competitively priced computers directly to buyers, who can configure systems according to individual needs, remains a winning formula. Net revenue for FY04 was $41.4 billion (from $35.4 billion in FY03), with the company expanding into the consumer electronics sector last year. Global product shipments rose 19% in the second quarter of FY05, outpacing the rest of the industry, with server shipments to China alone up 41%. Dell is rolling out an eighth generation of more powerful PowerEdge servers. Dell.com is one of the world’s highestvolume e-commerce sites, with more than 1 billion page requests per quarter. EA is the world’s leading independent developer of interactive entertainment software. Its innovative mix of diverse media—including video, photo images, motion capture, 3-D body rendering technology, computer graphics and stereo sound—helped drive sales of more than 1 million units each for 27 EA titles in its 2004 fiscal year. Revenues were $2.96 billion, up from $2.5 billion the preceding year.The company operates development studios in the US, Canada, Japan and the UK, and this year launched the EA Game Innovation Lab at the University of Southern California as a state-of-the-art research space. The company that invented the air conditioner, elevators and the first working helicopter has now developed the first commercially available hydrogen fuel cells and designed life support systems for the Space Shuttle. The $2.6 billion invested in R&D; last year helped translate into $31 billion in revenues and $2.4 billion in net income. Sales to the US government alone were $5.3 billion, while 57% of revenues were international. Its business units carry such world-renowned names as Carr ier, Chubb, Otis, Pratt & Whitney, Sikorsky and Hamilton Sundstrand. The latter was selected to supply four major systems for Boeing’s new generation 7E7 Dreamliner. Bechtel builds things on a grand scale. Since 1898 the company has completed more than 22,000 projects in 140 countries, including Hoover Dam in the 1930s, expansion of the Athens subway in time for this year’s Summer Olympics and current construction of what will be the US’s longest suspension bridge (Tacoma-Narrows). It is also under contract with the US government to rebuild infrastructure in Iraq. In 2003, when it held the industry-leading record by achieving zero lost-time incidents on 90% of its projects worldwide, Bechtel booked $20.9 billion in new work (versus $12.7 billion in 2002). Whirlpool is the world’s leading manufacturer of home appliances, with $12.2 billion in 2003 sales and nearly 50 manufacturing and technology research centers worldwide. It sells products in more than 170 countries under the KitchenAid, Roper, Bauknecht, Ignis, Brastemp, Consul and Whirlpool brands and is the largest supplier of major appliances to Sears under the Kenmore brand. In 1999 it launched a global effort to instill innovation as a firm-wide core competency, resulting in employee-driven ideas and products.Whirlpool is committed to performing among the top 25% of large public companies in total return to shareholders. Selected for the fifth consecutive year as the industry leader for the non-cyclical goods and services sector in the 2004 Dow Jones Sustainability Index, Procter & Gamble produces and markets some of the world’s most trusted consumer brands. These include Pampers, Tide, Pantene, Folgers, Pringles, Charmin, Crest and Olay, among others in nearly 50 product categories. Company sales grew 19% in the past year, to $51.41 billion, topping the $50 billion mark for the first time in its history. Net earnings were up 25%, to $6.48 billion, and the company expects double-digit earnings growth again in the coming year. Some might think it would be tough for Lockheed to top its $200 billion contract in 2001 to build a next-generation fighter jet—the largest contract in Pentagon history.Yet this year it led a team that landed a $2 billion Navy contract to build a new tactical satellite communications system, got a Pentagon contract to build a new biometric identification system and is even working to create a new fleet of presidential helicopters. Of the $31.8 billion in 2003 sales ($76.9 billion order backlog), 62% were to the Pentagon, 19% to other US government agencies, and 18% were international. Over $7 billion in revenues and 550,000 clients make ADP one of the world’s largest computing services firms, offering human resources administrative services, integrated securities transaction processing and investor communications services, and computing solutions for automakers and car dealers. ADP payroll services not only pay one in six US private sector workers but are the single source for employee administration in 26 countries. This year it unveiled a paperless payroll service and a new version of its Web-based time and attendance solution for SMEs. The company will continue to benefit from the current business process outsourcing trend. Sony’s quest for innovation accounts for much of its brand equity. Having created the first color VCR, the compact disc, the minidisc player and the DVD player, among other cutting-edge products, it continues to “push the envelope” on technology through partnerships with Microsoft, Intel, Philips and Sun Microsystems. Buyers worldwide regard Trinitron TV sets,Walkman personal stereos,VAIO PCs and Mavica digital cameras as top-notch electronics. In fact, a 2003 Harris poll ranked Sony as the number-one brand in the US for the fourth year in a row, beating out its American rivals. Service reliability, excellent customer care and retail energy prices that are 15% below the national average are part of the Southern Company’s secret for success. A super-regional energy company servicing parts of Georgia, Alabama, Mississippi and Florida, it has more than 4.2 million customers and nearly 39,000 megawatts of generating capacity.The company is now growing its competitive wholesale business by adding another 1,240 megawatts to its existing 4,777 megawatts of wholesale generation by 2005. It also plans to invest another $5 billion over the next decade to deal with pollution from its plants. Formerly known as GE Power Systems, GE Energy is one of the leading suppliers of power generation and energy delivery technology. It supplies equipment, services and management solutions to the power generation and distribution, oil and gas, and energy rental industries. In addition to introducing several new products this year, the company completed tests on GE compressors for Europe’s first LNG plant, located in Norway; was selected to provide wind turbines for Taiwan’s first wind generation project; and supplied prime and backup power for 45 Olympic sites at the Athens summer games. ConAgra is one of the US’s leading packaged food companies, with a brand portfolio that includes such favorites as Armour, Butterball, Chef Boyardee, Fleischmann’s, Hunt’s,Wesson and Libby’s. Its products are found in more than 95% of US homes. ConAgra’s transformation into a producer of higher-margin branded and valueadded products led to record earnings in the year to 2004 that rose another 8%, to $3.5 billion, in the quarter ended August 29, 2004. This year it announced its 30th consecutive year of dividend increases. Subway was a virtual trailblazer in bringing the low-fat craze to the fast food industry. It is estimated that Subway, which runs 22,000 restaurants in 74 countries (expected to grow to 25,000 by end-2005), serves 1,900 sandwiches worldwide every minute. The US armed forces even opened a Subway shop at Camp Speicher in the Iraqi city of Tikrit this year, bringing a taste of home to American troops. As one of the fastest-growing US franchises, it operates more units in the US and Canada than McDonald’s. In 2003, global sales for Subway restaurants reached $6.8 billion. CEO: William W. McGuire, M.D. UnitedHealth Group provides a comprehensive array of health services, including employer business services and health plans, network-based health care services, and knowledge and information services.The company serves some 55 million customers nationwide and has become a market leader by introducing innovations to make healthcare more accessible. The group this year announced the formation of a new European healthcare firm, led by a British management team, to serve the region’s public health systems. Revenues in 2003 rose 15%, to $28.82 billion, with 39% ROE, and the group has upped its earnings growth estimate for 2004. A mix of brand strength, an international presence, specially designed “Heavenly Beds” and an attractive frequent guest program continues to make Starwood properties among favorite lodging options for business and leisure travelers alike. The company operates more than 700 hotels in 80 countries under its St. Regis, Luxury Collection, Westin, Sheraton, Four Points and W brands, which cater to luxury and upscale market segments.After a slump last year as part of an overall downturn in tourism, Starwood’s financials and market shares are rebounding this year, partly due to its disposal of non-core and “trophy” assets. As the largest US insurer, MetLife services individuals in 13 million US households, in addition to 8 million customers in 11 other countries. Its institutional business segment has 88 of the Fortune 100 as clients, while the firm provides benefits to 37 million employees and family members through plan sponsors. Premiums and annuities for group life plans grew 8.7% year-on-year in the second quarter of 2004, while annuities grew by a stronger 58.6% and reinsurance by 41.8%. Net income in 2003 grew 38% year-on-year, allowing MetLife’s board to approve a 100% hike in annual dividends for 2004. What started as an online auction site has fast become a global pastime, redefining the e-commerce experience. The eBay community includes millions of registered users worldwide who bid on items ranging from antiques and collectibles to fine jewelry and cars. Users can also log in to local sites in 17 countries. The total value of items sold in 2003 was a record $24 billion (+60% year-on-year). Serving merely as a moderator—with no inventory or fulfillment responsibilities—eBay posted consolidated net revenues of $2.17 billion in 2003 (+78% year-on-year). Revenues are expected to hit $3 billion this year. Founded in 1907 as a messenger company in the US, UPS has since grown into a $30 billion global logistics firm with one of the world’s most recognized brand names. As the world’s largest package delivery company and a leading provider of specialized logistics services, UPS delivers in more than 200 countries and territories worldwide. The US Department of Transportation this year gave UPS the green light to triple its flights to China. In addition, its UPS Store retail franchise chain operates a network of 5,000 locations in 40 countries, further consolidating its global presence. Viacom is a leading global media company, with positions in broadcast and cable TV as well as in radio, cinema, outdoor advertising, publishing and the Internet. It operates in 166 countries and territories, and its well-known brands include CBS, MTV,VH1, Paramount Pictures, Showtime, Blockbuster and Simon & Schuster. In 2004 it announced a strategic alliance with Beijing Television to produce Chinese content, it acquired Germany’s Viva Media as well as the US-based SportsLine.com website, and it launched CBS Paramount International Television to distribute programming worldwide. The company is active in creating media messages and programming to combat HIV/AIDS. Revenues in 2003 were $26.6 billion. Ranked as the world’s leading producer of primary and fabricated aluminum, as well as alumina, Alcoa serves the aerospace, automotive, packaging, construction, commercial transport and industrial markets. As a testament to the breadth of its product offerings, the same company that gives us industrialstrength aluminum also produces Reynolds Wrap aluminum foil. In 2004 Alcoa increased its stake in China’s sole alumina producer, initiated construction on an extrusion facility in Romania and broke ground on a $1.1 billion smelter in Iceland. Its long-term environmental program, based on sustainable development principles, is often regarded as a model. It is impossible to talk about the Internet without mentioning Cisco Systems. Its engineers pioneered Internet Protocol (IP)-based technologies in the core areas of routing and switching, as well as many other applications. Its product innovations have set industry standards. It recently introduced CRS- 1 as the world’s highest-capacity Internet router, capable of handling 92 terabits of data and offering the industry’s first 40Gbps interface. This year Cisco announced plans to open an R&D; center in China, launched a venture capital operation in India and established new financing services for SMEs in Korea. ExxonMobil is an industry leader in each of its core businesses, conducting business in nearly 200 countries, maintaining refineries in 25 countries and operating nearly 40,000 service stations in more than 100 countries. It is also the world’s top supplier of lube basestocks and a leading marketer of finished lubricants. As a result of its R&D; efforts, which have prompted the granting of more than 10,000 US patents over the past decade, the company invented 3-D seismic imaging technology now used industry-wide to find oil and gas without breaking ground. After the acquisition of Pharmacia in 2003, Pfizer is by far the world’s largest drugmaker. Its product portfolio includes Lipitor, the cholesterol-lowering medication that is the number-one prescribed drug in the world. Lipitor’s $9.2 billion sales in 2003 were more than Pfizer’s total sales in the 1990s. Estimates say nine tablets of Pfizer’s Viagra drug to treat erectile dysfunction are dispensed each second worldwide. The company introduced programs to reduce drug costs for over 40 million uninsured patients in the US this year. 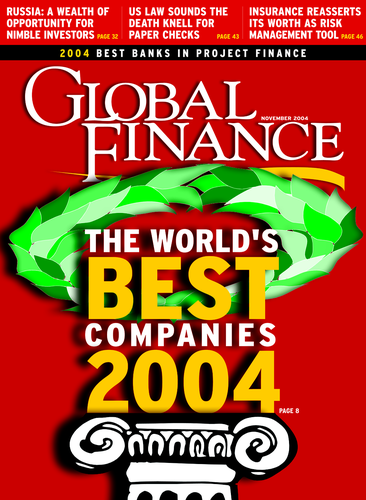 Its $45.2 billion sales in 2003 (up 40% over 2002) were the company’s best ever. In its most recent fiscal year,Wal-Mart generated a record $256.3 billion in global revenue, up 11.6% over 2003, as shoppers continued to hunt for bargains at the world’s largest retailer.The company operates more than 3,600 stores in all 50 US states and another 1,300 stores in nine countries under various formats:Wal-Mart Stores (discount retailer),Wal-Mart Supercenters (general merchandise and groceries), Sam’s Club (warehouse membership clubs) and Neighborhood Markets (groceries, pharmaceuticals and general merchandise). Plans call for opening more than 250 new stores this year, adding more than 50 million square feet of retail space. Motorola is a global leader in wireless, broadband and automotive communications, as well as embedded electronics. The company has gone from developing the world’s first commercial handheld mobile phone in 1983 to becoming a major innovator in new generations of handsets, including this year’s introduction of the Ojo personal video phone that uses a broadband modem and high-resolution video camera to deliver full-motion video and high-quality audio. Motorola also offers converged devices that put a mobile phone, PDA,MP3 player, digital camera and gaming device in a single unit. Sales were $27.1 billion in 2003. Verizon—formed in 2000 through one of the largest mergers in US history—is one of the world’s premier telecom companies, with some $67.8 billion in 2003 operating revenue ($7.3 billion in net income).Verizon is the largest wireless and wireline provider in the US, the world’s largest phone directory publisher (circulation 141 million) and a leading telecom provider in Canada, Europe, Asia and Latin America. In the US alone, it has more than 40 million wireless customers, with its footprint covering nearly 90% of the population, while its wireline services reach one-third of households. Altria is the parent company of both Philip Morris USA and Philip Morris International (PMI). Four in 10 cigarettes sold in the US are Marlboros, Philip Morris’s flagship brand. A 2.3% drop in shipment volume in 2003 at the US division was offset by strong sales at PMI, which holds a 14% share of the global market. PMI reported a 1.8% rise in shipment volume, to 735.8 million units, while revenues rose 10.9%, to $6.3 billion. PMI produces seven of the top 20 cigarette brands, including Marlboro and L&M;, the world’s number-one and number-three brands, respectively. Costco’s formula of selling brand name merchandise at lower prices in bulk packaging and in a no-frills environment that allows cost savings to be passed on to consumers has proven to be a winning combination. Its 442 warehouses in eight countries and territories brought in net sales of $47.15 billion in fiscal-year 2004—a 13% year-on-year hike—that was also boosted by annual membership fees of $45 to $100 paid by 42 million members. Stores average 136,753 square feet of retail space. The format has worked particularly well for SMEs seeking to cut purchasing costs for resale and business use. With oil prices showing no signs of easing, Europe’s long-haul carriers are finding it tough going. Greater synergies and cost-savings through cross-border M&A; is something European airlines have pursued, but few have actually achieved— until May this year,when Air France and Dutch carrier KLM merged, creating Europe’s largest airline. The merger is expected to deliver cost savings in the region of €495 million over five years, and in its first quarterly announcement as a combined company Air France- KLM reported a 12.3% increase in turnover and an operating profit of €156 million, compared with a €1 million loss a year earlier. The French car manufacturer may not figure in S&P;’s top 10 companies by sales, but it has captured the public’s imagination with its new Mégane and Espace models, which have substantially boosted operational performance. First quarter 2004 revenues were up 11.6% compared with the same time last year. The success of its new models saw operating margins increase to 6.1% of revenues. Despite initial capital outlays associated with its acquisition of a 44.4% stake in Nissan, stronger financial performance from the Japanese car manufacturer— with a net income of €919.4 million in the first quarter 2004—is expected to impact Renault’s accounts to the tune of approximately €430 million. Pernod Ricard’s acquisition of the Chivas Regal whiskey brand from Seagram in 2001 is bearing fruit, with sales volumes for the premium whiskey brand during the six months to June 2004 increasing by 11%, alongside similar increases for other Pernod brands such as Glenlivet whiskey. The thirdlargest spirits firm in the world saw pretax profits for the first six months to June increase by 5.8%, with the US and Asian markets accounting for 80% of growth in profits. Germany’s BASF is one of the world’s largest chemical producers. Although it does not boast the pharmaceutical interests of some of its competitors, the closely integrated nature of its businesses, encompassing chemicals, plastics, agriculture, and oil and gas, has provided some protection from the cyclical nature of the chemicals business. For the financial year ended 2003, BASF generated €33.4 billion in revenues, an increase of 3.6% over the preceding year. After issuing a surprise profits warning in the first quarter to June last year, the Swiss-founded mouse- and keyboardmanufacturer ended the 2003 financial year with record Q4 net income of $38.5 million, an increase of 44% on the preceding year.Year-end figures were also robust, with sales reaching $1.26 billion, an increase of 15%. Its winning streak continued into the first quarter this year, with sales increasing 22%, to $267 million, which is largely attributable to the success of its core product lines: cordless mice and webcams. SAP, which features among the global top-five software companies by market share, found itself embroiled in the Oracle/ PeopleSoft saga recently, after People- Soft’s CEO was removed in anticipation of a bid from Oracle. Expected to gain through the uncertainty surrounding PeopleSoft by picking up some of its customers, the German enterprise software company’s share price rose by 3.3% on Germany’s DAX index and almost 3.6% on the Nasdaq. Good news, considering that 2003 revenues declined 5.2%, from €7. 4 billion in 2002 to €7 billion. By the end of last year, however, SAP had made up some ground on its four closest competitors, increasing its overall market share from 51% to 59%. The Netherlands’ Royal BAM found itself moving up the league table following its purchase of Dutch construction group HBG in 2002, which also included Flatiron Corporation in the US, significantly boosting its footprint outside of its core European markets. Following the acquisition, the Dutch group was ranked fifthlargest construction company in Europe based on turnover. Net profit for 2004 is expected to reach €80 million, compared with €56 million in 2003. The world’s largest beauty company, French-based L’Oréal has significant product reach outside of Europe, with leading consumer brands such as Maybelline and Redken. New launches and cost-cutting measures saw operating profit increase by 7.8%, to €1.1, billion in the first half of this year, with professional and consumer products contributing the bulk of the growth. While growth in Western Europe was sluggish, sales in Asia grew by more than 22%. The outcome of a merger between France’s Aerospatiale Matra, Daimler- Chrysler Aerospace in Germany and Spain’s CASA, EADS is certainly Europe’s largest player, with sales of €30 billion. EADS also has an 80% stake in large commercial aircraft manufacturer Airbus, whose new A320 and A380 models helped it retain the highest book order number in 2003 in terms of aircraft deliveries (305 units in production) and aircraft orders (284 units in development). The leading German electronics manufacturer appears to have beaten declines in its share price in the early part of 2003, posting strong financial results up to June 30 this year. Operating profit for the period increased by more than 20% on the previous year, and orders were up 11%.The company’s operations span IT, communications, medicine, transport and industrial automation. Eight of its nine product groups achieved margin targets for 2003, and it increased the profitability of its US operations. Europe’s second-largest utility, E.ON boasts a strong financial profile in the vertically integrated electricity and gas segments and has wide geographical reach, encompassing the German, Nordic, CEE, UK and US markets, which it has bolstered via acquisitions, including Powergen and Midlands Electricity in the UK and Ruhrgas, Germany’s largest gas operator. Integrating recent acquisitions remains a challenge for the company, which plans to invest €13.8 billion over the next three years in maintaining and expanding its gas and electricity networks. While less exposed than some of its competitors to the vagaries of the European summer, which saw ice cream sales plummet, Nestlé’s diverse product range, which encompasses dairy, confectionary, water, grocery items and beauty products (through L’Oréal), has helped it weather difficult market conditions that have seen some of its competitors issue profit warnings. In the first quarter of this year sales grew by 5.1%, assisted by its exposure to the fast-growing bottled water market as well as by high-growth acquisitions such as Chef America. Recent increases in business travel and reservations have improved the company’s credit outlook. Its diversified business model of hotel owner-operator, hotel management and franchising protects it from the volatility of the hotel ownership business. Its gaming operations have also helped it achieve relatively stable income at times when overall hotel profitability has fallen. For the 2003 financial year, the group posted revenues of £8.9 million, an increase of 38.6% on the previous year. The global re-insurance sector continues to report strong underwriting performance, with one of the world’s largest re-insurers reporting a decline in premium rate increases to 4% in January 2004. It continues to benefit from a strong global franchise and capitalization. In the first half of this year it doubled its net income to 1.4 billion Swiss francs, compared with 691 million Swiss francs during the same period last year. Return on equity was a robust 15.6%. The German postal, express and logistics company, which owns DHL International, continues to face tough competition in the US market, where it has increased investment in its transport network to try to counter the efforts of rivals such as UPS and Federal Express. In September it announced that increased investment in the US was likely to move break-even targets for that market back, which caused its share price to fall by 3.9%. However, it hopes to offset this with gains in other markets, such as Asia. Vivendi may seem a surprise inclusion. After all, the company, which former CEO Jean-Marie Messier transformed from a water utility into one of the largest media organizations in the world, fell victim to its former CEO’s grandiose ambitions. However, having divested most of the assets Messier acquired to pay off debts, Vivendi is looking more streamlined these days, retaining its interests in French pay television company CANAL+ Group, Universal Music and leading French mobile telephone company SFR Cegetel.Vivendi’s stake in SFR and substantial debt reduction saw Standard & Poor’s upgrade the company’s long-term debt from BB to BBB-. Luxembourg-based Arcelor is the world’s largest producer of flat carbon steel. A number of strategic alliances with Nippon Steel and its 28% stake in Brazil’s CST has enabled it to expand outside of Europe, into the US and Chinese markets. In an effort to increase sales to manufacturers of cars, it is also pursuing joint ventures with US companies. Despite gloomy growth forecasts for Europe and the US, Arcelor’s financial strength and success at reducing costs are stabilizing factors. It may not be as profitable as BP, which recently announced multibillion-dollar quarterly financial results on the back of high oil prices, but the French oil and gas company is fifth in the world in terms of oil and gas production and has diversified interests including power generation, coal, refining and chemicals. It also controls 12% of Europe’s service station market. Despite its exposure to emerging markets, its reserve portfolio is well balanced across low-cost production centers such as the Middle East and West Africa. It also boasts healthier production prospects than some of its peers, with average annual production predicted to grow at 5% until 2007. Headquartered in Basle, Switzerland, Novartis produces a range of pharmaceutical and healthcare products for humans and animals. Net income for 2003 was $5 billion, compared with $4.3 billion the preceding year. Sales of generic drugs saw revenues increase 19% in 2003, to $24.9 billion. Unlike at some of its competitors, which are faced with “patent risk” and poor R&D;, new products are driving organic growth at Novartis. The French label’s divestment of its electrical parts division Rexel and healthy earnings at luxury fashion label Gucci have bolstered its financial performance. In the second quarter this year, sales at Gucci increased by 10.5% on a comparable basis, while retail sales for the group increased by 6.1%. With more than 2,300 stores worldwide, the UK’s largest food retailer, with a market share of 27%, is expanding its global footprint. While other supermarket chains are struggling, Tesco appears to be able to do no wrong. For the year ended February 2004, it reported revenues of £35.6 billion, constituting an increase of 18.7%. International, non-food and Internet sales saw profits increase by 17.6%. European telecom equipment manufacturers face numerous challenges, not least of which is downward pressure on prices of handsets being exerted by Asian manufacturers, which could threaten Nokia’s dominance. In July this year, Standard & Poor’s revised its outlook on Nokia from stable to negative, due to erosion in its market share and profitability of its mobile phones business. However, the company’s net cash position remains fundamentally strong. In the first half of last year its share of the mobile handset market stood at 35.5%. It has also tried to combat pricing pressure on handsets by moving into the gaming console market. With sales of $57.9 billion, France Télécom is among the top three telecommunication companies worldwide based on sales/revenue. In a sector characterized by high investment costs and acquisitions, France Télécom’s prudent financial management and efforts to strengthen its balance sheet by reducing costs saw its longterm credit rating upgraded to BBB+. While its buyout of minority interests in French ISP Wanadoo will temporarily increase debt, this should be offset by the sale of its yellow pages business. It also owns UK mobile phone operator Orange. Price and tax duty increases and increased regulatory oversight, with smoking bans imminent in some European countries, have put considerable pressure on tobacco manufacturers. Yet despite these difficult market conditions, UK-based Imperial Tobacco held its own—and even experienced growth in the “roll-your-own” market—while it continued to cut costs. Its improved product mix is expected to sustain strong cash flows for the remainder of the year. In the UK its market share is 43%, but the company also enjoys a presence in less mature markets in Central and Eastern Europe, Germany, Australia and New Zealand. Having been briefly blown off course by the SARS crisis, which had a dramatic impact on travel to and within Asia last year,Asia’s most respected airline made an operating profit of S$307 million ($182 million) for the first quarter of this financial year (to June 30)—a S$684 million turnaround from the same period last year. Revenue growth for the first quarter this year was a huge 64.8%, to reach S$2.73 billion, while the company was wily enough to hold down spending growth to just 19.1%, making a total of S$2.42 billion. Toyota achieved a lot in the fiscal year ended March 3. Net revenues increased 11.6%, to ¥17.29 trillion ($156 billion), and operating income reached a new high of ¥1.66 trillion, an increase of ¥395.2 billion, or 31.1%.While the com- pany benefited from the ¥107 billion transfer of a portion of the employee pension fund to the government, more impressive was the ¥230 billion achieved in cost reduction and the fact that the company was working at full capacity. Although Foster’s Berginer Blass wine unit was a disappointment during the financial year to June 30, other elements of this diversified beverages giant more than made up for it, and the company made a normalized net profit after tax of A$549.2 million ($396 million). Fosters believes it has now got the strategy right to be able to improve its results significantly in the coming years, and the growing profile of its core Fosters brand in North America should also increase shareholder value. Reliance Industries became India’s first private sector company to earn more than a billion dollars in net profits during the financial year: It earned $1.18 billion—putting it among the top 150 companies by profits globally. Revenues for the year were $17.02 billion, while exports were $3.43 billion. While the global semiconductor market recovery remains fragile, TSMC announced record-setting revenue and net income for the quarter ended June 30. Revenue reached NT$64.87 billion ($1.92 billion) while net income came to NT$23.41 billion—meaning revenue increased 12.8% from the previous quarter and 30% on the same period in the previous year. Net income increased 24.6% from the previous quarter and an impressive 100% from the previous year. All this came on top of a record financial year in 2003. For the first quarter ended June 30, Infosys once again outperformed, with revenues of $335 million, up 43.78% from the same quarter in 2003. At the same time, the company continues to rack up awards for corporate governance, technical innovation and reliability and is truly a world-class player in technology. In the last quarter alone, Infosys has added a major US toy retailer and one of the largest family footwear retailers in the US to its client list.As outsourcing grows, Infosys can only benefit. The group’s unaudited profit for the first half of 2004 was HK$12.48 billion ($1.6 billion)—a 106% increase compared with the same period last year. Part of this amazing performance is down to disposals totaling HK$15.06 billion, compared to HK$1.92 billion last year, but with Asia’s most legendary businessman Li Ka-Shing at the helm, investors can be assured exits have been made at the most fortuitous time. Hutchison’s ‘3’mobile network is still loss-making but has lowered its cost of acquiring customers and now has well over 3 million customers worldwide. The interminable delay to Japan’s economic recovery means that Mitsubishi Heavy Industries has looked overseas for growth. For the fiscal year ended March 31, the company—which operates in industries ranging from power and energy to transportation and shipbuilding, in addition to construction and engineering— saw a continued rise in exports, primarily to the US and China. The company posted a year-on-year increase in orders on the back of this export performance, mainly in shipbuilding and thermal power plant projects. Samsung has achieved the goal it set itself five years ago: to become one of the world’s leading companies and an aspiration brand in the electronics world. The company has combined huge investment in technological resources with marketing prowess—such as its partnership role at the Athens Olympics—to make itself a first choice for consumers in markets such as the rapidly growing LCD and plasma televisions sector. Meanwhile, with sales of 14.98 trillion won ($13 billion), operating profit of 3.73 trillion won and net profit of 3.13 trillion won in the second quarter of 2004, Samsung achieved another record-breaking quarter. Consolidated net sales for the quarter ended June 30 showed an increase of 6.5%, or ¥13.8 billion, from the same quarter a year earlier for Japan’s numberone maker of personal care, laundry and cleaning products.While the sluggish domestic economy hit cosmetics sales, the company has been eager to create new markets—both geographically and in terms of its product mix. Promisingly, Kao has made a significant effort to expand into North America and Europe in the past year. The world’s largest manufacturer of consumer electronics—under the JVC and Panasonic brand names, among others— grew strongly in the quarter ended June 30, with consolidated group sales up 19%, to ¥2.10 trillion, from the same quarter a year ago.The decision to rationalize production and reduce competition between Matsushita Electric Industrial and its 51%-owned subsidiary Matsushita Electric Works is likely to prove fruitful, and the move to focus attention on the core Panasonic brand is also yielding results. New president and CEO Han Joon-ho has vowed to reshape Korea Electric Power from a conservative utility to a highly innovative and creative organization that looks overseas for opportunities. Its financial situation appears to be improving as a result: Once one of the largest victims of the Asian financial crisis, the company is expected to receive a higher rating than the government when Moody’s next assesses its risk. Kepco reported its highest quarterly profit in three years in the third quarter of 2003, with net income gaining 11% from the same period a year earlier to reach 1 trillion won ($850 million). Sales rose 4 %, to 6.12 trillion won, with operating profit rising 7.4%, to 1.13 trillion won. Leading food and health group Ajinomoto has recently completed its three-year plan to expand business in growth sectors, shift toward a highearnings structure, strengthen corporate governance and nurture personnel capable of working in the global market.The changes seem to be paying dividends. Net sales for the year ended March 31 increased 5.2%, to ¥1.04 trillion, while, supported by ongoing programs to reduce costs and raise efficiency, operating income increased 20.6%, to ¥65.2 billion. Innovations such as the launch of products including cholesterol-reducing mayonnaise—a perfect example of the company’s focus on R&D;—should set the stage for further growth. In April a subsidiary of 7-Eleven Japan opened the first Chinese-foreign joint venture convenience store in the People’s Republic of China, setting the company up for dramatic potential growth. Closer to home, the company has recently become the first to have more than 10,000 outlets in Japan. For the year ended February 29, 7-Eleven Japan achieved revenue and earnings growth for the eighth consecutive year: Revenue from operations reached ¥474.3 billion, operating income ¥165.7 billion, and net income ¥93.1 billion. Millennium & Copthorne Hotels is the London-listed international hotel arm of the Hong Leong Group Singapore. It owns and operates 90 hotels in 16 countries, making it the 40th-largest hotel group in the world. For the six months to June 30, the company recorded turnover of £262.7 million ($468 million)—up 8% on the previous year. More impressively, operating profit increased 131% from the preceding year, to £35.8 million, as returns from the group’s new Millennium Hilton Hotel in New York began to kick in. Mitsui Sumitomo managed a historic achievement during the past year: It moved from the number-three company in the country in terms of non-life consolidated net premiums to the numbertwo company—the first change in the positions of Japan’s top-three non-life insurance companies in 46 years. Net premiums increased 5.8%, to a record high of ¥1.38 trillion, for the financial year, while net income also hit a record high of ¥116.1 billion. Meanwhile, pre mium income of Mitsui Sumitomo Kirameki Life (which is wholly owned) was ¥424.7 billion, making it number two in the variable annuities business just 18 months after being set up. With total assets of $51 billion and total annual revenues of approximately $21 billion, News Corp. is a goliath in the industry. But scale does not prevent the company from showing impressive growth: Full-year revenues rose 20%, to $21 billion, and operating income increased 21%, to $3.1 billion, for the financial year—both record numbers for News Corp. As the company’s integration strategy gains pace, further growth seems inevitable. Rising commodity prices driven by demand from China have buoyed BHP Billiton: It signed a $3.2 billion contract with the country in September to supply ore. But the company has also been clever in one of the other major global growth markets, India, by signing a deal with the state-controlled Steel Authority of India. For the financial year ended in June, the world’s largest diversified resources company generated a record profit of $3.5 billion. Although Indian company ONGC has been affected by a government decision to force energy companies to subsidize prices to buyers, the company’s underlying performance is still exciting. During the quarter to the end of June, ONGC’s sales revenue increased by 31%. Turnover has doubled, to $10 billion, in the past two years, and the company believes $50 billion is a realistic medium-term target. Having changed its name from Takeda Chemical Industries to more accurately reflect ambitions to be a world-leading pharmaceutical company,Takeda has also refocused its management, with a new structure to accelerate decision-making. Income figures showed growth again, as they have consistently for more than a decade: Operating income grew 19.6%, to ¥371.6 billion, and ordinary income increased 10.1%, to ¥446.1 billion. With 560 stores worldwide, the growth of the Hong Kong-based fashion retailer Esprit appears to be unstoppable.Analysts had predicted double-digit growth, and Esprit didn’t disappoint them: Group turnover grew 32%, to over HK$16 billion, for the financial year 2003, while net profit rose 55%, to HK$2 billion, as a result of strong margin expansion. Cash flow from operating activities was again strong; net cash on hand increased by HK$437 million, to HK$1.8 billion, as expansion continued apace. As Samsung has converted its vision of being a top-flight global electronics company into reality, cellular phones have assumed greater importance. Figures for the second quarter show that Samsung had a 12.1% market share of handsets— from 10.2% a year before—and is gaining on number-two firm Motorola. Many believe that Samsung could take second place behind Nokia in 2005. In a market still growing at 35% a year, that would be a significant achievement. DoCoMo achieved record earnings in the financial year 2003 through increased promotion of data communications, in which it leads the world. The company recorded consolidated operating revenues of ¥5.05 trillion, up 5% year-on-year, operating income of ¥1.1 trillion, up 4.4%, and net income of ¥650 billion, up 205.9%.The operating income and net income figures were record highs for DoCoMo. The world’s third-largest listed tobacco company—and the dominant domestic player, with a 70% market share—is not complacent. It has successfully diversified into pharmaceuticals and food products while focusing on premium sectors within tobacco. Net sales in the year ended March 31 increased 3% yearon- year, to ¥4.63 trillion. LAN remains a money-maker in a challenging environment marked by high fuel prices and a global downturn in passenger traffic. Last year, as some carriers struggled for survival, LAN’s sales were up 12.8% year-on-year, to $1.64 billion, while net income soared 171.4%, to $83.6 million. It maintains a solid mix of passenger and cargo loads, a frequent flier program linked to the One World alliance, and an extensive route network. Once known as LAN Chile, the company changed its name to LAN Airlines this year in recognition of its regional franchise, operating local carriers in Peru and Ecuador. Mexico’s FEMSA is Latin America’s largest beverage company, producing and marketing 46 soft drink and 15 beer brands sold in the US, Canada, Latin America, Europe and Asia. Its FEMSA Cerveza division is Mexico’s secondlargest brewer, producing such wellknown brands as Tecate, Carta Blanca and Dos Equis at its six breweries. Its Coca-Cola FEMSA joint venture is the world’s second-largest Coca-Cola bottler, with production and sales in nine Latin American countries. Total revenues and operating income have grown at compound annual rates of 10.7% and 15.7%, respectively, over the past 10 years. Braskem is not only Latin America’s largest petrochemicals company but also one of Brazil’s five largest private firms.The company churns out 5 million tons of primary, base, secondary and intermediate petrochemical products each year and is the region’s leader in the thermoplastic resins segment. Braskem rebounded from a $280 million loss in 2002 to a $75.8 million net profit in 2003, despite difficult market conditions. It is no surprise, then, that its class-A preferred shares on the São Paulo stock exchange gained 508% in value last year, while its ADRs on the NYSE rose 609%. One of the largest conglomerates in Latin America, Mexico’s Grupo Carso is involved in the retail, industrial and consumer businesses. Retail divisions range from Sanborn’s restaurants, Mixup music stores and the El Globo bakery chain to a majority stake in local Sears department stores. On the industrial side, its subsidiaries include everything from a railway operator and a mining company to producers of PVC and copper goods. Its Cigatam joint venture with Philip Morris is Mexico’s largest tobacco company. Shaky consumer demand dampened 2003 profits, although revenues still rose 1.9%. Odebrecht turned 60 this year and had much to celebrate. The firm has grown into a global powerhouse, with international operations generating 81% of gross revenue last year. In addition to operations in Latin America, Europe, the US and Angola, it established a Middle East presence in the UAE this year and began operations in the East African nation of Djibouti. Among other projects, Odebrecht has built facilities that provide 66% of Brazil’s hydroelectric generating capacity, is expanding the Caracas subway and has a contract to build the Carrizal-Chone irrigation system in Ecuador. Kimberly-Clark’s Mexican subsidiary (KCM) manufactures and markets paper- based products used daily by millions of Mexican consumers, including disposable diapers, bathroom and facial tissues, school notebooks and office products. It is also the country’s largest producer of fine writing and printing paper. Its best-known brands include Kleenex, Huggies and Leeds. KCM has annual sales of over $1.55 billion, with $100 million in exports each year to 14 countries. In 2003 stockholders received a dividend for the 40th consecutive year. Its mills recycle wastepaper, allowing for the substitution of 280,000 metric tons of virgin pulp each year. Brazil’s Embraer is the world’s leading manufacturer of regional jets, holding a 40% share of the market for 30- to 120- seat aircraft. This year it rolled out its 170/190 family—a new generation of larger 70- to 100-seat jets. Air Canada already signed a purchase agreement for 45 Embraer 190s, with a potential value of $2.7 billion, while Finnair placed an order for 12 76-seat 170s, with a potential value of $510 million. Embraer is also providing its ERJ 145 platform for the US Army’s next-generation battlefield surveillance system under an $879 million contract. Copel is a vertically integrated power company involved in generation, transmission and distribution, operating mainly within the Brazilian state of Paraná.Yet its 3 million distribution customers include unregulated users in the states of São Paulo and Rio Grande do Sul as well. Copel—one of Brazil’s most respected companies—has diversified into the telecom sector and holds stakes in firms involved in sanitation, Internet services and agribusiness. It has also provided consulting services in Argentina, Chile, China, Colombia, Malaysia and Paraguay.Revenue in 2003 rose to $1.05 billion, from $941.1 million in 2002. Mexico’s Grupo Bimbo is one of the world’s leading bakers in terms of brand and trademark positioning, sales and output volume.The company maintains production in Mexico and the US, as well as in 14 countries in Latin America and Europe. Its bakeries produce over 4,500 products and more than 100 brands, ranging from breads and pastries to confectionery goods and tortillas. In order to deliver to 690,000 points of sale worldwide, Bimbo operates one of the world’s largest distribution networks, with 26,500 routes and over 25,300 vehicles. Net sales were up 5.2% in 2003.